How I consumed Greek, Irish, German, Indian, Spanish and Himalayan deliciousness during one glorious day in Queens. My fiancé and I love to explore. I don’t know if I’ve ever said this out loud, but when I think of exploring I pretty much just expect that I’ll be exploring different food establishments. So, when he got invited to watch a soccer match with his friend in Astoria, my first thought was – I haven’t eaten that much in Queens. I invited myself along so that we could “explore” afterwards. Our first stop, on the recommendation of his friend, was Euro Market. I got excited even about the name. Some of my favorite “exploration” has taken part in Europe. As could be expected in Astoria the majority of Euro products were Greek, and while I’ve never been to Greece I can honestly say I feel that I’ve now gotten a taste of it. When we first walked in, to my delight was a huge cheese counter spanning the whole length of the store. I’ve been to a lot of cheese counters, but I’ve never seen so much feta. At Euro Market, there were at least eight blocks of it, five feet long sitting in its murky water looking fresh and delicious. I was so overwhelmed by the sight that initially I didn’t make my move and the cheese man behind the counter passed right over us to the woman who obviously knew better what she was doing. After she was done I had to leave it up to the cheese man. I asked for his favorite and he did not hesitate to cut us off a corner of the block farther to the right. 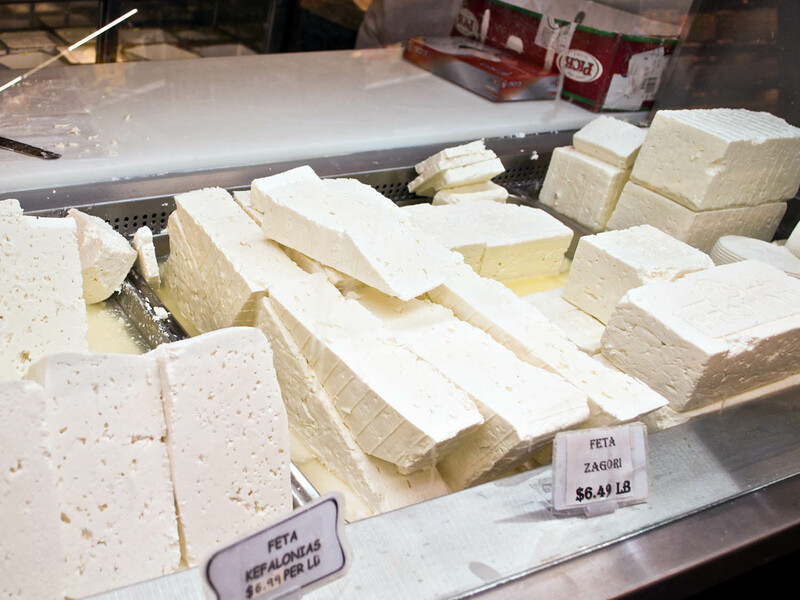 I can’t imagine ever being picky about fresh feta, so I eagerly accepted and ordered a quarter pound (for approximately $2!). Other store highlights: fancy olive bar, dried teas and herbs, sodas I’ve never heard of and lots of hard to find spices. I ended up with cheese, olives and Hungarian Hot Paprika to carry around for the rest of the day. Astoria, I don’t think I ever realized, has food from every country around the world. Walking down Broadway I saw Italian next to Japanese next to Korean next to Greek. We couldn’t help stopping in an Italian bakery for some sprinkled cookies to bring home with us (again a $2 purchase for 6 cookies!). 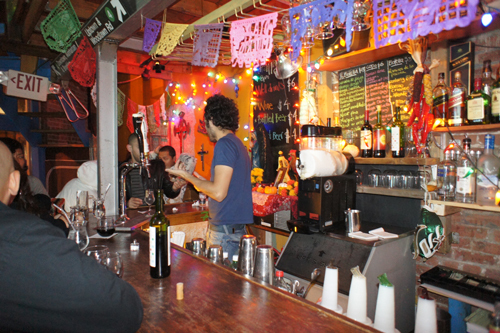 Mixed in among all the wonderful cultural finds are of course some hipster establishments. 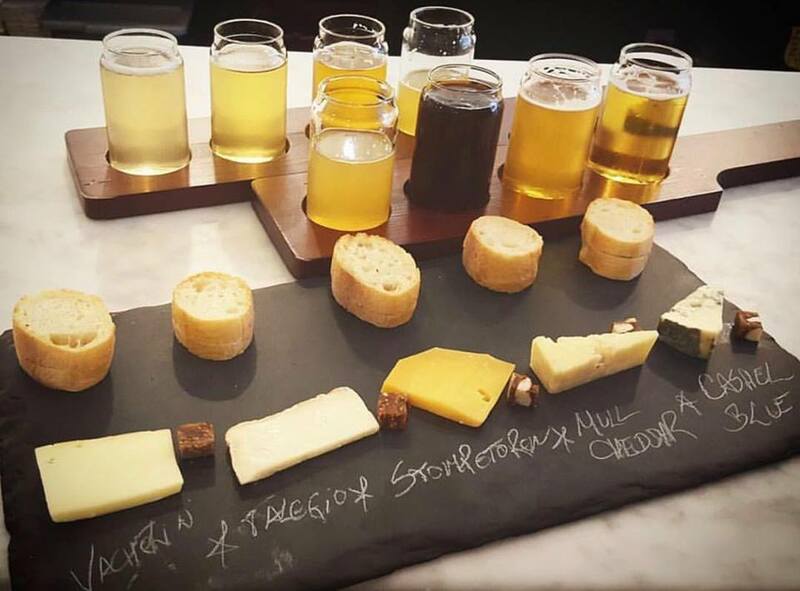 While most of our day was incredibly spontaneous, we did have a plan to stop at Astoria Bier and Cheese for a flight pairing. Astoria Bier and Cheese is one of those places that I just want to take everyone I know (probably because I have “cheese friends” and “beer friends”), and could probably spend a whole day just sampling all they have to offer. We, however, had big plans and had to move on. As we continued east we hit Woodside – an area my fiancé knew for being very Irish. 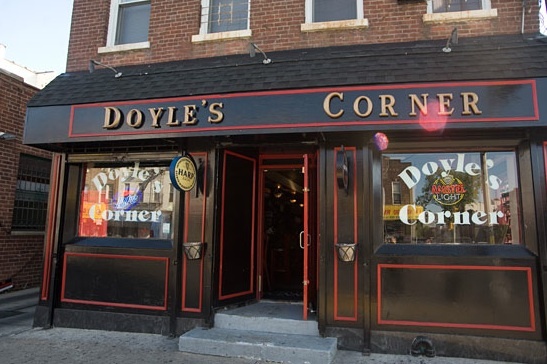 As we had just been all over Ireland last Spring attending his cousin’s wedding and visiting his family, we knew how to spot an authentic Irish pub when we saw one, and Doyle’s Corner was just that. Maybe it’s not the most unique or exciting place to make a stop, but they were playing all the football games. My fiancé had conceded to not watching the game in its entirety during our Queens adventure, so to make him happy we stopped in just for the end of the game, plus a Guinness and a Jameson. It was all worth it for the wonderful accent on the redheaded bartender that made us both nostalgic for our overseas exploration last May. The transition from Woodside to Jackson Heights doesn’t count as exploration for me because there is no food there – just car parts. The entrance into Jackson Heights though! I’m sure anyone who has actually been to India would scoff (and I hope to be one of those people one day), but it truly felt to me like entering a different country! While sitting at Astoria Bier and Cheese I had done a little research, but luckily my form of “exploration” cannot simply follow what the internet tells me to do. I love a good market of any kind (as you may have noticed in my gushing over Euro Market), and the internet pointed me to Patel Brothers. On our way there, however, we passed by Apna Bazaar Cash & Carry and the energy there just looked too amazing to resist. 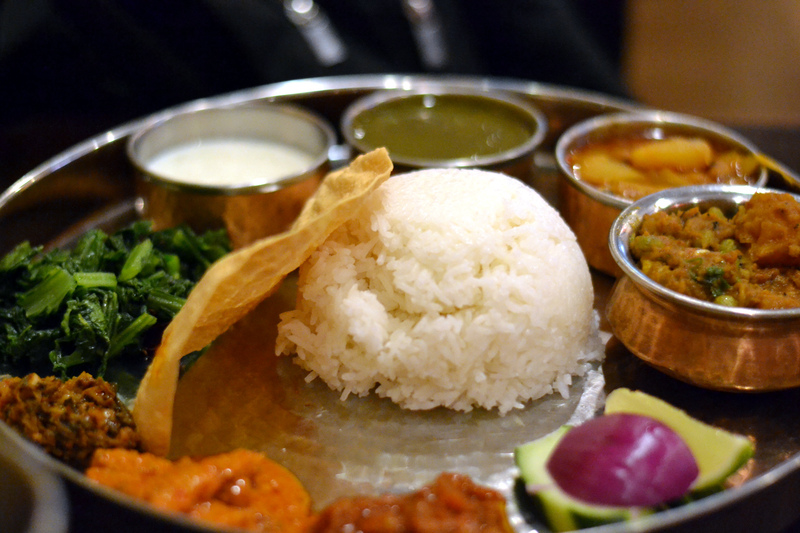 I have to admit to a little intimidation – though I have eaten plenty of probably quite Americanized Indian food I’m quite obviously a white blonde girl wandering in amidst the rice and spices and curries. But I couldn’t contain my excitement. A bottle of rose water, a package of moong dal, a jar of ghee and some kolanji seeds later I had gotten over any reservations and couldn’t wait to continue our exploration. We did stop at Patel Brothers which was also great, but just couldn’t compare to our initial entrance to the neighborhood. Since we had stopped at the Italian bakery, we also couldn’t resist Maharaja Bakery, though we were much less familiar with what we purchased. 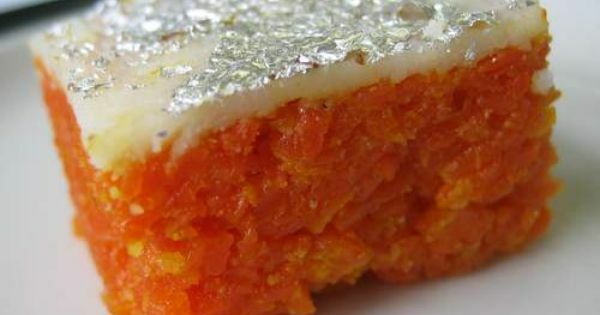 I once again asked the woman behind the counter for her favorites and we left Maharaja Bakery with an arrangement of colorful, silver foiled sweets that I could not begin to describe. With a little bit of time before dinner we wandered farther east in search of a drink (and a bathroom). Pretty suddenly the scene around us transitioned from India to Latin America. After a quick Google search we found ourselves at Terraza 7 for some Sangria. It’s obviously a place that’s happening later in the evening and I absolutely hope to return to see some music. Again with a little help from the internet combined with a recommendation from a friend we backtracked a bit back west and found ourselves at Himalayan Yak. Some of our first ever dates were at a Himalayan restaurant in Paris called Gorka which has since closed, but a dish called Gorka on the menu made us feel right at home. True to its name, Himalayan Yak has a lot of yak dishes. We went for the yak momos (dumplings) along with some blood sausage, wild boar belly and a vegetable thali. This might sound like too much food for two people. It was. It was also not aided by the “butter tea” which I thought sounded different and exciting – and I’m sure is an acquired taste – but is pretty much melted butter and hot water. After the beer, whisky, cheese, sangria, massive amounts of meat I have to admit I couldn’t handle it. I pride myself on “exploration” and was a little disappointed in myself for not being able to finish the abundance of deliciousness in front of me, but it was all worth it in the end when the next night we were able to eat all the leftover meats with some green beans cooked up with my newly purchased kolanji seeds. This is Leah Perlmutter’s first Waddle story.